We know immediately from the title that this book accepts the existence of a “New Wave” in British cinema. B.F. Taylor begins with an unambiguous canon. For the record, his series in full is: Room at the Top (Jack Clayton, 1959); Look Back in Anger (Tony Richardson, 1958); The Entertainer (Richardson, 1960); Saturday Night and Sunday Morning (Karel Reisz, 1960); A Taste of Honey (Richardson, 1961); A Kind of Loving (John Schlesinger, 1962); The Loneliness of the Long Distance Runner (Richardson, 1962); This Sporting Life (Lindsay Anderson, 1963); and Billy Liar (Schlesinger, 1963). My first doubt comes with the unwavering assertion of this canon. A canon is usually meant to be solid but can occasionally become a loose, and therefore dangerous, thing. Taylor does not investigate why these films are included in the canon when others are left out. To add to the confusion, his thesis is that the films in this canon are not a solid series with much in common, but a series of highly individual films. He immediately announces that “the time is now right to take an alternative approach and consider each of the films individually” (p. 1). However, the films do share a common base. His quotation from Peter Hutchings is still valid: “these films were seen by critics of the time as a step forward for British cinema” (p. 2). The problem is that Taylor applies an either/or criterion. The films can be seen as both a series and individual works. I do not see any problem with allowing such a simultaneous set of criteria. The fact is that as the films are heavily realist and share a common location, it is inevitable that, in general terms, they tend to be considered as a group. As all but three of the films in Taylor’s canon were produced by Woodfall Productions, it would be surprising if they were not so unified. It is the predominance of Woodfall which is the key to any analysis of the British New Wave. The triumvirate of Harry Saltzman, Tony Richardson and John Osborne ran the company for the specific purpose of maximising control over the screen adaptations of plays which had come to prominence at the Royal Court Theatre in London in the mid 1950s. In fact, the first time the “New Wave” tag was applied to British film was in an article written by Saltzman for Films and Filming in April 1960 (1). The primary criterion which Saltzman applies is “independence”. By this he means that the films were not produced by any of the companies tied to the “big two” in Britain: Rank and Associated British Pictures Corporation (ABPC). This independence was not meant to be a long-term condition. According to Saltzman, the initial films’ success would mean that their mode of production would be the norm. It was the subject matter that was new, not the method of film production. When we consider that Look Back in Anger, the first film produced by Woodfall, had financing from Warner Brothers and ABPC, then the question of independence becomes somewhat problematic. The films in Taylor’s canon do share a similarity, not only with each other, but also with other social realist British films of the time. It is a peculiarity of British film history that the films produced by Beaver Films, another short-lived independent production company, are never included in the British New Wave. Beaver was set up by Richard Attenborough and Bryan Forbes with similar aims to Woodfall: to make independent films on subjects which the Rank Organisation would reject (2). In the end, Beaver produced only three films – The Angry Silence (Guy Green, 1960), Whistle Down the Wind (Forbes, 1961) and Séance on a Wet Afternoon (Forbes, 1964). All three were moderately successful, but have suffered critically by not being allowed a place in the New Wave canon. Whistle Down the Wind in particular shares many of the criteria evident in the films included in the canon: it has a Midlands/North setting, a realist aesthetic, a first time director and it even has Alan Bates in between two iconic New Wave films, The Entertainer and A Kind of Loving! Of course, it also has Hayley Mills in the lead. At the time, she was Disney’s hottest property and came to the film as a star, but then Laurence Olivier was hardly an unknown when he played the lead in The Entertainer. The body of the book is devoted to individual film analyses. Here we begin to see the problem with the approach. There is a chapter on Tony Richardson as the director with the most films in the canon, then a chapter on Jack Clayton’s Room at the Top, because it is always included as the first New Wave film. Schlesinger gets two chapters, one for Billy Liar and one for A Kind of Loving. Finally, Karel Reisz and Lindsay Anderson get a chapter each, the former for Saturday Night and Sunday Morning and the latter for This Sporting Life. The analysis of the films is interesting if unexciting. If the films are being stressed as different, one continually wonders what they are all doing in the same book; each chapter could equally function in a book devoted to the individual directors. The book would have created greater interest if there were some original statement in it; for instance, why is Look Back in Anger allowed, with its Hollywood finance and Hollywood star, when Whistle Down the Wind is not? Why is Woodfall, and for that matter Vic Films, the production company behind Schlesinger’s films, allowed when Beaver Films is not? These exclusions say as much about the critical heritage of the British New Wave as anything written about the films which are included. My point with this is that ever since the Saltzman article in 1960, these films have been saddled with an arbitrary label which has defied most taxonomical efforts ever since. The only true similarity these films have is a tyro director and a Midlands/North location. The underlying lynchpin of the group is its synchronicity. They were films made within a specific period which announced the advent of a new group of directors. Taylor is correct that they do not have an overarching aesthetic and should be considered individually. On these terms, however, they are a historical phenomenon, and in terms of British film history, the phrase British New Wave retains its validity. For my own purposes, I depart from Taylor’s taxonomy only by the inclusion of Forbes’ first film as director – Whistle Down the Wind – as a valid entry in the canon. The peculiarity of the book, then, is that as an analysis of the films concerned it is an interesting work, but it still begs the question of its own existence. As Taylor admits in his conclusion, rather than consider the films collectively – that is, as an identifiable canon of the British New Wave – his aim has been to “consider each of the films individually” (p. 171), which rather negates the inference of the title. If there was a “New Wave”, it is the similarities of the films concerned which are important; otherwise the book is a collection of essays on disparate films with no discernible linkage. This was not, I think, Taylor’s intent. 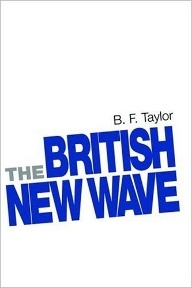 The British New Wave: A Certain Tendency?, by B.F. Taylor, Manchester University Press, Manchester and New York, 2006. Harry Saltzman, “New Wave Hits British Films”, Films and Filming, vol. 6, no. 7, April, 1960, p. 1. For details on the aims of Beaver Films, see Peter Baker, “Bryan Forbes: Jack of all Trades”, Films and Filming, vol. 7, no. 12, September, 1961, p. 5 and Richard Attenborough, “Two in Harmony”, Films and Filming, vol. 7, no. 12, September, 1961, p. 9. Michael Fleming is a PhD candidate in Cinema Studies at the University of Melbourne. He is researching director John Schlesinger in the context of the changing nature of British Cinema in the 1960s. His particular interest is the retreat from realism to surrealism as a cultural phenomenon of the sixties.